Any work trip up north has it’s positive side, in that I can pack my bike and get some northern miles in during the evenings (and sometimes pre-breakfast too). So a tour of Scotland doing exhibitions from Aberdeen down to Edinburgh meant the bike just had to come too! Aberdeen is a long drive from Peterborough, you certainly can’t get up a couple of hours earlier and get there in the morning! So having to spend most of my Sunday driving I decided that a stop off just over the border for a couple of hours riding was well deserved. Makes for a good driving break too, gets the blood flowing through those legs again! So Sunday saw me riding a route I’d done once before and longed to ride again on a day with less hail and wintry showers; my loop from Abington (near Abington services on the A74(M)) to Sanquar and up over Mennock Pass. Parking up in Abington village car park, I got out my bike while chatting to a local elderly Scotsman about how bikes aren’t what they used to be ‘back in the day’. I always find people to be very friendly up in Scotland away from the cities. And although there had been a light splattering of rain on the A74(M) approach, it was now shaping up to be a lovely afternoon even with the slight breeze. It really is a lovely route to ride and a relatively uneventful, but absolutely enjoyable, out leg saw me making good time despite the rolling hills and sheep on the roads. Then it was a case of turning onto the main road, heading up from Sanquar to Mennock and up and over the Mennock Pass. I must have been in a bit of a world of my own when the chap in dayglo yellow riding an Eriksen Ti bike passed me. What ever the reason it certainly woke me up from my slumber and I picked up my pace to try to match him, riding a polite distance behind. Then as the lower slopes were coming to an end and the steeper sections looming, we both caught and passed another rider and I came up alongside dayglo man. ‘Are you heading up to the ball?’ he asked. With it being an unusual question and the wind making a fair noise, I assumed that I’d misheard him but he repeated his question and I told him that I’d just planned riding up and over the top. 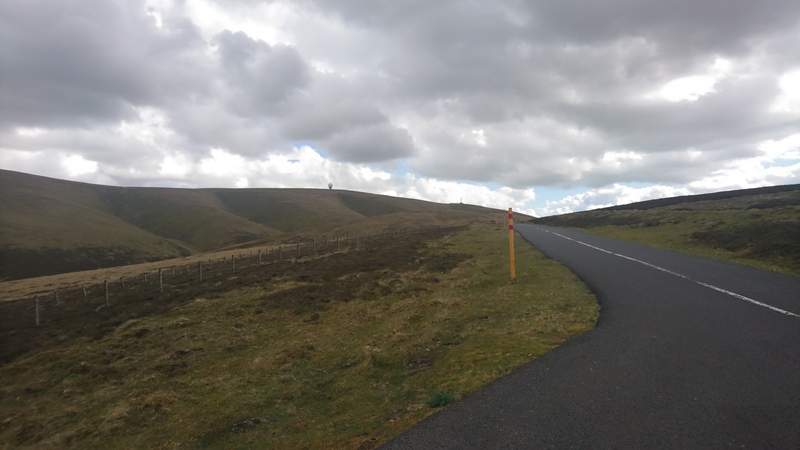 The short conversation that followed as I struggled to talk coherently and ride up the now increasingly tough gradient of Mennock Pass revealed that at the top was a ‘closed road’ that branched off the main road and heads up to a radar station atop Lowther Hill. It turns out that this guy is pretty local to the area and as well as knowing the roads well he clearly had the climbing legs and although I closed the gap when the gradient shallowed a little, he pulled away anytime it got properly steep. 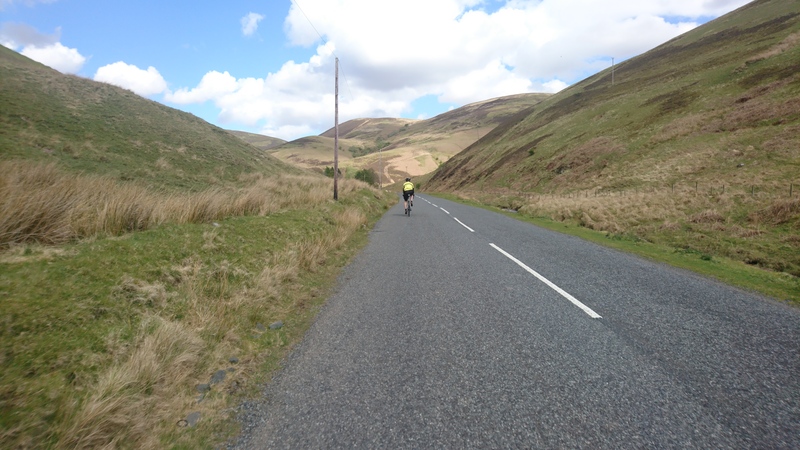 As I reached Wanlockhead I kept my eyes peeled for him anyway, I thought I might see the back of him heading up a hill somewhere but he was nowhere to be seen. It was only as I almost left the village on my road ‘over the top’ that I spotted him up on the ‘closed road’. So I took my bike around the barrier and decided to follow for a while. Can you spot the ‘ball’ on top? Unfortunately, my need to continue my journey to Aberdeen, still several hours of driving away, was playing on my mind. And so when I turned a corner and got a clear view of the ‘ball’ on to of the hill, I decided that it was too far for my available time on this occasion. Better head back down to the car and get going! It’s just one more ‘ride for the future’ now though. 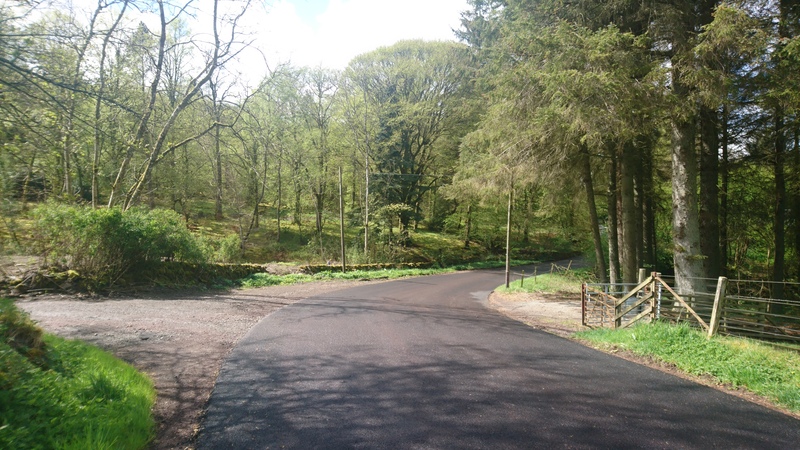 As far as I can tell from my OS maps, the extra closed road section pretty much doubles the total ascent, making this one of the highest road climbs available in the UK. As there are very few paved roads that go to the tops of hills, most are passes that go over between the peaks. I may have been disappointed to have run out of riding time but this was just the first day of my Scotland trip and so I remained confident that I’d get some more opportunity to get out on my bike during the rest of the week and one long fun descent later I was packing my bike away into the car again and heading off to Aberdeen.